Not long ago I was, quite frankly, an internet noob. Sure, I’ve used the internet for email and instant messaging since the ’90s, but aside from researching for school papers, my internet use rarely went beyond that. Of course I was on MySpace and Facebook in high school and college – everyone was on such social networking sites, and that was often the best way to stay in touch with my friends after we graduated. Little did I know, there was an entire world I was unaware of. On November 1st, 2006, I entered the world of blogging. Up until then, I had never subscribed to or commented on a blog – I didn’t even know what an RSS feed was. The internet was a scary place – who knew what sort of people were behind the avitars and screennames… for all I knew, these were weirdos trying to decieve us all into thinking they were really the people they pretended to be online. Little by little, I learned that this was rarely the case. Ralph Whitbeck and Yvo were two commenters who have been with Sushi Day from the beginning. They started as complete strangers, but slowly I have gotten to know the real people behind the blogs. This was just the start to a wonderful community of real people I have gotten to know over the internet. There are some I’ve been lucky enough to meet in person, and so many more I hope to be lucky enough to meet someday. However, the food blogging world was just the start. Although vast and full of amazing people, some of my closest online friends have come from blogs completely unrelated to the food blogging world. There are so many fantastic bloggers I want to tell you about, but for now I’ll limit myself to introducing you to Karen Swim. One of the strongest women I know, she writes inspirational posts that help you live your life to it’s fullest, and always make you think. Not to long ago, she was lucky enough to work with Harry and James from Men with Pens, who made her a beautiful new design for her website. You really should go check it out… it’s incredibly elegant, and suits her perfectly. In celebration, I promised her I’d make a new roll, just for her. (Because really, what’s more awesome than having your own roll, made just for you? 😀 ) I used all my favorite ingredients – green onion, scallops, tuna, avocado, tempura shrimp, and spicy mayonnaise – and combined it all to make one of the prettiest rolls I have ever made. 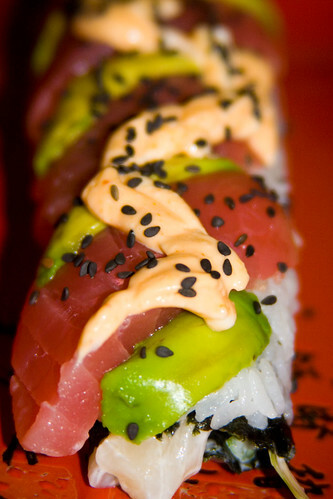 The ingredients all meld together to create a delicious explosion of sashimi flavors in your mouth, accented perfectly by the avocado, green onion, and spicy mayonnaise. Truly amazing – enjoy! Cut the tails off the tempura shrimp. Wash the green onion, cut the long green stalks off of the white bulbs. Discard the white bulbs. Slice the scallops into several pieces, about a centemeter square. Mix with 2 tbsp mayonnaise. Slice the tuna into thin pieces, about the same width as the avocado slices. Mix the rest of the mayonnaise with the Sriracha sauce. Roll the sushi inside-out, using a stalk of green onion, 2 pieces of tempura shrimp, and one scallop worth of chopped scallop as your fillings, but don’t cut the roll quite yet. 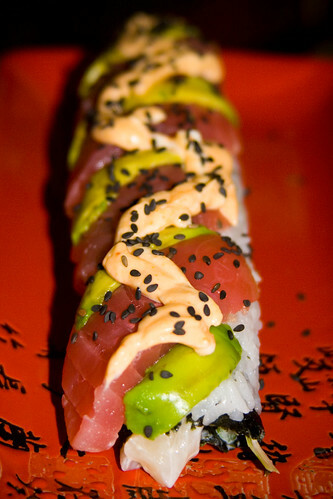 Lay alternating strips of avocado and tuna diagonally over the roll, overlapping slightly. 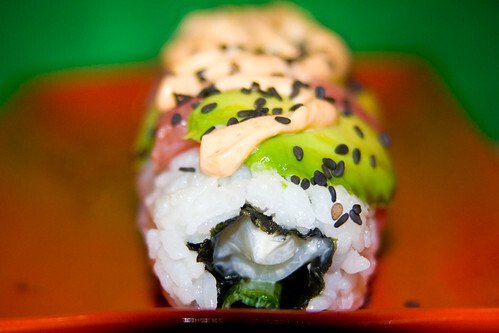 Using the plastic wrap-covered rolling mat, press the tuna and avocado tightly into the roll. Cut one tip off of a ziplock bag. Fill the bag with the spicy mayonnaise. Squeeze the spicy mayonnaise over the roll. Sprinkle black sesame seeds on the top of the roll. Slice the roll into six or eight pieces. I am completely blushing all over again. Thank you so much for the kind words and the beautiful roll (YUM! Drooling now). One of the things I love about sushi, in addition to the taste, is the artistic presentation. You combine the ingredients much as a painter chooses colors from a palette to blend into a masterpiece. However we can eat your art! LOL! I’ll second the part about that looking delicious! What a process to make it, too! blimey, this roll looks awesome. You make it look so bloody easy too. The last roll I tried to make was a mess! Course, that was 6 years ago now. Great stuff as usual, loving your blog. 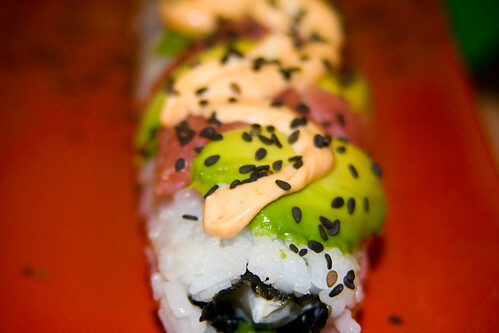 This roll looks particularly delicious. 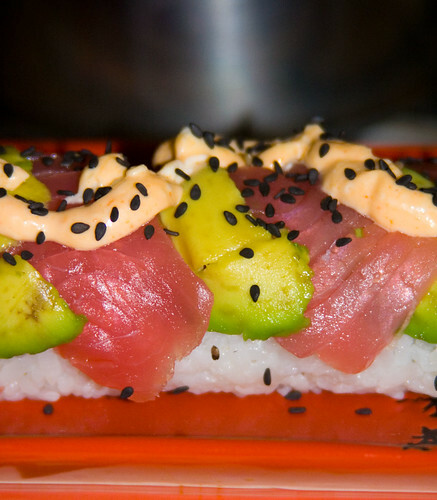 I hope to achieve that visual splendor of the avocado/tuna laid on top of the roll one day. you have a great site here. 🙂 congratulations! i’m inspired by the fact that making sushi is just a hobby for you. 🙂 i’ve linked you to my site, if that’s ok?